Russell Crowe’s divorce from his wife of nine years, Danielle Spencer, is close to being finalized. So he celebrated by selling a bunch of Russell Crowe swag through Sotheby’s Australia, according to People. 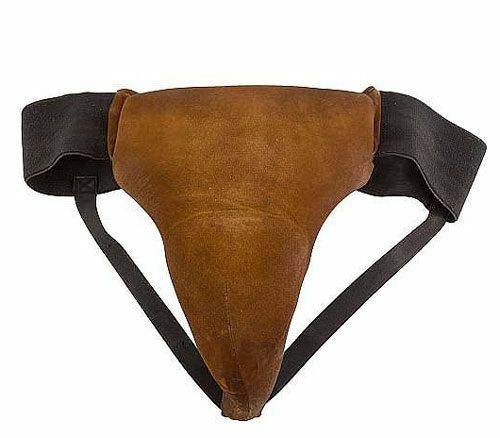 Included among the memorabilia was his leather jockstrap, which went for $7,000. And believe you me, that jockstrap has seen some AK-SHUN. Those nights when Russell wasn’t kicking Azealia Banks out of hotel room dinner parties or trying to murder hotel clerks with phones, he was down at the Ramrod making all the (uncut) power bottoms gasp with his beefy majesty. If that leather jock could talk! Wait – wut? Oh, it was the leather jock he wore in Cinderella Man? Oh, ok. Nevermind. The jury will disregard that Russell Crowe as leather-daddy fantasy. In a tweet, Russell claimed that the collection, jauntily titled “The Art of Divorce,” netted him 3.7 million in five hours. What the hell was he selling that netted him that much – the pics from when he seduced Meg Ryan into cheating on her husband? Or did he off-load the hoverboard that caused so much strife during Christmas of ’15? Actually, besides his jock, he auctioned off “movie mementos, clothing, artwork, watches, furniture and guitars.” And it reads like he’s going to make even more money once negotiations over his thong or something are over. Russell also turned 54 yesterday, so this was birthday funzies, too. He’s been separated from Danielle since 2012. The letter from Russell unequivocally stating that his heaps big dongar had once been swaddled in that delicate piece of leather was probably way more entertaining than the jockstrap itself. Watch Russell touring the items that were up for auction on Good Morning, Britain below.